The New South Wales bus association is doubtful a proposal to allow cars in Sydney’s bus lanes will ease traffic gridlock. NSW opposition roads spokesman Ryan Park recently wrote to the State Government asking it to look at a proposal to allow cars with three passengers and a driver to travel in bus lanes at certain times. The proposal was reportedly backed by the NRMA. But BusNSW Executive Director Darryl Mellish isn’t convinced. "We understand the government is looking at ways of better utilising limited road space, however I doubt if the expanded use of bus lanes for cars – with four people – will do much to ease traffic," Mellish says. "It would certainly be of concern in high-frequency bus situations." whether people will take up car pooling to a level that makes a difference – as long as it does not interfere with bus services. "You would have to select the trial location carefully," he says. Mellish says people travelling on buses in bus lanes significantly reduce congestion. But if people are not choosing to use bus services instead of cars they add to congestion, especially in busy periods. "In many cases if the buses are full there should be more frequent bus services provided, however the ability to get even more buses in and out of Sydney requires more infrastructure and support for BRT (bus rapid transit)," Mellish says. Mellish adds that policing the incorrect use of bus lanes is already an issue and would be further complicated by the proposal to open the bus lanes to car poolers. Calls to open the bus lanes to cars come after a leading transport academic suggested bus lanes could be opened to trucks in some cases to reduce congestion in NSW. 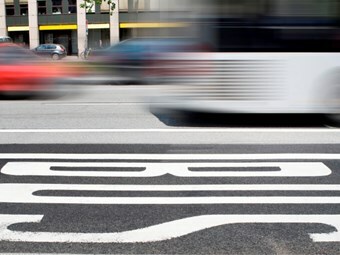 University of Sydney’s Institute of Transport and Logistics Studies (ITLS) Director David Hensher says the idea of ‘no car lanes’ could be used in some areas with low-density bus use to help reduce congestion.